On of my favorite finds in recent years is Mystery Skype. I’ve tried it with several classes in several states, and even did a Mystery Skype with my friend Ms. Turken while she was teaching overseas in Ecuador! As I have written about previously this year, there are many things I have brought from 5th grade with me that I’ve been excited to try with my firsties, and Mystery Skype is one I finally pulled out of the bag this week (mainly because of an invitation from a friend on Twitter to schedule one soon!). The idea of Mystery Skype is really simple (try to figure out where the other class is located by asking yes/no questions), but it can take some time and practice to get good at it. I knew I needed to practice with my kiddos before our first “real” MS, so I called on my friend Ms. Turken for help again. She was totally game. I asked her to help us by letting us Skype with her class, and at first I was just going to work out the kinks of having kids come up to the camera, making sure we talked loud enough, etc. Then I thought it could be cool to try to actually do a Mystery Skype…INSIDE of our school! So I asked Ms. Turken to take her kids to a secret place in our building and we would try to figure out where they were located by asking good questions! Before they called us, we spent some time working out the logistics of how you would even begin to narrow down someone’s location in this big, wide world of ours. Using Google Maps and a map of our school, we had some up-front teaching about continents, countries, states, cities and how to narrow down a location by eliminating the possibilities. We talked about directions and how just asking north, south, east, west can cut out a HUGE part of the world that they are considering. We also talked about landmarks (both natural and man-made), and how these can be helpful in determining a location, as well. When we looked at our Robinson maps, we connected these ideas to the floor our friends might be on, as well as our school “landmarks” they might be near, like the gym, cafeteria, library, elevator or bathrooms. They caught on really quickly, and were excited to get started! Our friends called us and kiddos got busy! Rm. 202 kids were paired up with a friend, and they worked together to study the map, consider the clues they got from our friends’ answers, and then decide on our next question. Pairs took turns coming up to the computer to ask their question and get the answer. 8. Are you in MRS. FRY’S CLASSROOM?–YES!!! YAY!! WE FOUND THEM!! After a bit of cheering and a few high-fives, we debriefed on how the experience went, as well as what we’d do for the “real” Mystery Skype session in a few weeks. 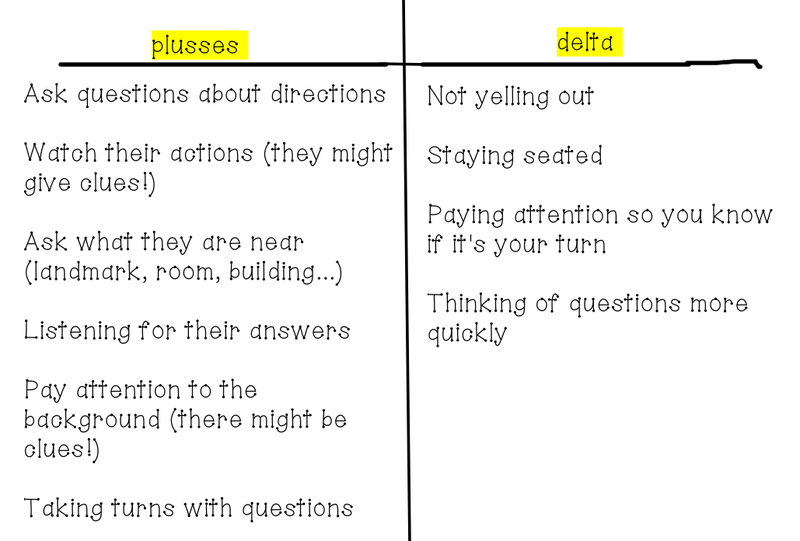 We used the protocol of “plusses” (things we’d do again) and “deltas” (things we’d change). I’d say they had some pretty great insights! I especially thought the one “watch their actions” was a good idea. It came because of the question we asked about our friends being “near Mrs. Fry’s room.” Millie noticed that Ms. Turkens’ friends were snickering and covering their mouths when they answered, which told her that they were probably IN her room. We agreed that often watching how someone reacts can give clues. I was beyond impressed with how well both classes of firsties did, and am continually amazed at how well “little” kids do with “big” kid things like blogging, Twitter and Mystery Skype. I’d say it’s proof that you should never underestimate someone because of their size! WAY TO GO, RM. 202 KIDDOS!